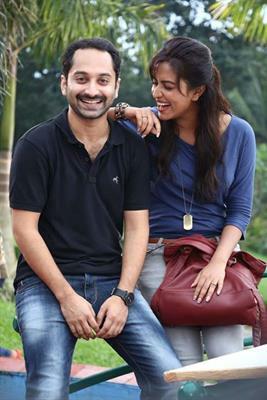 Oru Indian Pranayakadha malayalam movie directed by Sathayan Anthikad will feature Fahadh Faasil and Amala Paul in lead. Sathayan Anthikad known for his family-entertainers is coming up with a political satire. Fahad will don the role of a youth congress activist while Amala Paul will be seen in role of a non-resident Malayali. The shooting of the movie is being carried out at Kottayam. The movie will reach theatres as Christmas release. Sathyan Anthikad is a popular malayalam film maker who is known for his own style of telling tales keeping in mind of the family audience. Almost all of his previous ventures have been well accepted by the audience which gives huge reputation for him as an ace director. Sathyan is back on driving seat with his new movie creamed with love and humour. Titled 'Oru Indian Pranayakadha', the movie will have young generation hero Fahadh Faasil and beauty queen Amala Paul in lead. Being a political satire, the story of the movie zooms into life of a young politician and his romance with a girl. Fahad will don the role of a youth congress activist named Aymanam Siddharth whose sole aim is to succeed in life while Amala Paul will be seen in role of a non-resident Malayali who returns to Kerala. After the roaring success of Run Babby Run, Amala Paul in back in malayalam through 'Oru Indian Pranayakadha'. With the leading pair giving high hope for the movie lovers, Sathyan is giving his best to make the movie interesting for the audience. Much interestingly, Sathyan has tried to make a revolutionary change in the cast and crew with his current project. Sathyan who used to announce the title of the movie towards the end of the shooting has broken the rule by titling his movie on the first day of shooting itself as 'Oru Indian Pranayakadha'. Out of ordinary, the movie is scripted by Iqbal Kuttipuram who has scripted hit films like Arabikkatha and Diamond Necklace. The cinematography of 'Oru Indian Pranayakadha' is helmed by Pradeep Nair while the tunes will be set by Vidyasagar. The shooting of the movie is being carried out at Kottayam. The movie will reach theatres as Christmas release. Amala Paul who is making her bollywood debut with Gabbar has a couple of projects in kitty both in Tamil and Telugu.